Article DD3005b by Len Colgan. * See notes at end of article for correction, magalhaesii to subsecundum.. Many Australian bromeliad collectors would be aware of Rudolf Schulz, of Teesdale, Victoria. Rudolf is one of the most knowledgeable authorities in Australia on cactus and succulents, and has written and published many books on different genera. A lot of his knowledge has been acquired with hands-on experience during his many travels to the natural habitats, mainly in South America and Africa. In addition, during his trips, he often collects seed from terrestrial bromeliads which he later germinates and subsequently propagates the resulting plants in his nursery. A number of lucky Australians have been able to acquire species of Puya, Dyckia, Orthophytum, Encholirium, etc, that otherwise would be impossible to find. These are usually very prickly plants, but for those with a penchant for such goodies, Rudolf has provided exciting but often unnamed species. Of importance, and deservingly so, Rudolf was honoured in the July-August 2005 issue of the Journal of the Bromeliad Society International when one of his discoveries was named Orthophytum schulzianum. Rudolf is adamant that accurate habitat information must be maintained, and he uses satellite data to record the precise coordinates where collections are made. For example, he provides a list of Encholiriums ordered by numbers, such as Encholirium #3, Encholirium #5, etc, along with their habitat coordinates. A couple are currently in spike in my collection. The first of these to flower is Encholirium #6, which I have identified as Encholirium magalhaesii. 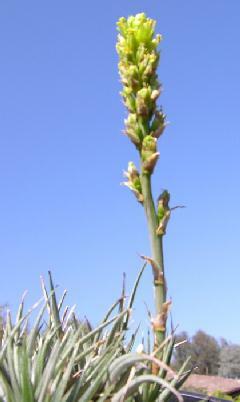 The grey-green conspicuously spined leaves are 28 cm long, and the height of the plant including the inflorescence is 70cm. It comes from the Chapada Diamantina, Minas Gerais, Brasil. 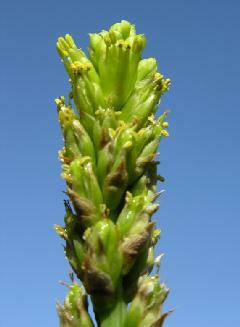 It has green petals and sepals with dry-brown apices. If you have Encholirium #6 in your collection, you can now attach the true species name. As other numbers are identified, I will provide information. Likewise, if anyone else has been able to provide other identifications, it would be appreciated if such knowledge could be forwarded. Incidentally, we have also been able to identify some of the Orthophytums whose seed was collected by Rudolf. * Correction to above article. Encholirium ‘Whoops’ by Derek Butcher and Len Colgan. Thanks to the article in Bromeletter 44(6): 6. 2006 we are now aware that there are more bromeliad people growing this prickly genus than first thought. They should be made aware that we made a slight misnaming with the assumption we had a large growing form of E. magalhaesii in Australia alias #6. Pot culture should have told us that the plant would be growing smaller than would be expected in the ground. The second plant – this time from Guenda, Minas Gerais – has flowered causing us concern because it had an inflorescence similar (but not quite) to #6. Surely this was not another but smaller E. magalhaesii ! Not only was the plant much smaller but the leaves were almost spineless. When you get into this situation you refer to the experts. So, photos were sent to Rafaela Forrza in Brazil who got her doctorate studying this genus! Such are the wonders of modern communication we now know we have an E. magalhaesii from Guenda and our #6 is really E. subsecundum. Apparently both species can be found near Guenda. We now include a photo of the true E. magalhaesii which was taken at an angle to suggest the plant is huge whereas the inflorescence is under 20cm tall. As a parting comment, your Webmaster, Ian Hook, did suggest that if we wanted a name for our plant from Guenda it could be called E. coli because of the affect it had on him. Presumably he prefers his plants mounted!